Here at Bullet Signs+Print, we understand the complexities in well executed printed collateral and appreciate that great creative design is only enhanced when finished professionally. We offer superior quality printing at affordable rates. Using both digital and offset printing we are able to offer the right and most cost effective solution for you. Please feel free to browse the products below and contact us if you have any further queries! A great looking business card is an essential business tool and is only enhanced by a high quality stock and superior print technology. Our cards come in a thick 360gsm artboard and are available in 2 standard sizes with the option of round* or square corners. They can also come in a gloss or matt laminate on either or both front and back. Other quantities are available, please contact us for a quote. Our A4 letterheads are printed on either 90 or 100gsm bond and are available in full colour on either single or double side. Our With Compliments Slips are DL Size (210x99mm) and are printed on 90gsm bond in full colour single side. Our envelopes are DL size 90gsm bond. They are available in either window or plain face and can be printed in full colour or single colour. Our Fridge Magents are printed in full colour single sided with the back face covered completely in magnet. They are thick stock and come with rounded corners. Our Labels are for interior use and come on 80gsm gloss stock. They are split at the back for easy application. For exterior stickers please click here. Other quantities and sizes are available, please contact us for a quote. Promote your business with our DL (210 x 99mm) marketing cards. Typically used for flyers, promotional cards, advertising, etc. These cards are in printed full colour on thick 360gsm artboard. They can be printed either single or double sided and can also be gloss or matt laminated for a more professional finish. Our Post Cards are printed full colour on thick 360gsm artboard. They are 150 x 100mm in size and can be printed either single or double sided. They can also be gloss or matt laminated. Our NCR books stand for "No Carbon Required", this means replacing the carbon sheets with tear out sheets for a much cleaner and more professional finish. 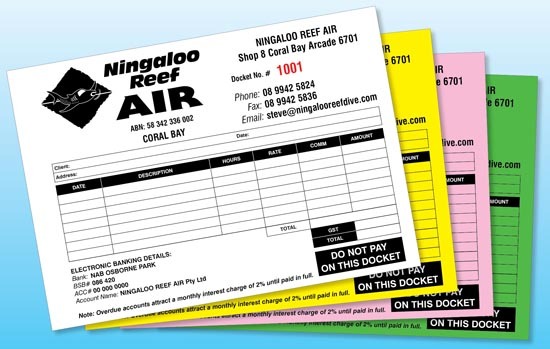 They can be used for invoice books, receipt books, quote books, purchase order books and more. Books come as either duplicate or triplicate copies depending on your requirement. Standard sheet colours in order are white, yellow, pink and green. They are generally printed in 1 colour to cut down costs but can come in full colour if required. All our artwork is custom made with your logo and details for a truly professional look. Standard sizes are A4 and A5. Please contact us for a quote as prices vary.